Rae Snape has been headteacher at The Spinney School in Cambridge since 2007. She is also a member of the DfE’s Primary Headteachers’ Reference Group where she has been helping the government reflect on its policies since 2010. What tips would you give to headteachers who are currently implementing change and school improvement? If we concentrate on those micro aspects of time – what’s happening today, for example – the balance can be much easier to manage. We should concentrate on the people and the relationships around us while at the same time also being mindful of a balance with medium and long term plans. Rae works with academics from the local Cambridge University and they compared approaches in academia to schools. In academia you can plan, prepare and take the time to think but in schools a change can be thought about on Monday morning and in place on Tuesday afternoon. Most experienced teachers, according to Rae, understand which battles they are not going to be able to win and so, in the interests of the children, they just get on with it. What does leading with hope and optimism look like on a daily basis? In their latest Ofsted inspection, the lead inspector called The Spinney ‘forward thinking and outward reaching’. This spurred on the school to continue making connections, building relationships. Rae believes that the more connections you can make and the more you reach out to people, the more positive your school will be. Despite always being mindful of safeguarding, this led to an ‘open school’ culture and a desire to connect with artists, researchers, businesses and the local community. This has created a sense of joy and positivity in the school. What practical changes could we make to schools to make them more positive places for teachers and learners? Rae says that we need to look at the public vilification of schools whose test results don’t show what was hoped for. Naming and shaming of schools in the press and on the web is fundamentally unfair, according to Rae. This doesn’t mean we shouldn’t hold schools to account for high standards. That sense of positivity starts from outside the school for Rae. There are small sculptural installations outside her school which have been created in partnership with local artists. There are also art objects around the inside of the school and Rae believes that schools should be beautiful places. Also, all members of staff ensure that there are lots of smiles and warmth around school. Warm drinks are actually shown by research to be important. Not only do people feel welcomed with a hot drink, they also tend to rate the host with a stronger sense of credibility as a result. This is a new initiative to celebrate hope and optimism in the workforce. It’s easy to gravitate towards the negative in education so this event is a deliberate attempt to shift thinking to a positive standpoint. It’s about honouring teachers who do such a wonderful job but sometimes don’t get the kind of credit they deserve. I was privileged to meet Rae a few weeks ago and listened with rapt attention to her talk! I love her idea that the only constant is change and as she talks she includes both the everyday (quotidian) and long term growth in this! She talks about her busy life with grace, gratitude and humour. She says that as a leader she maintains safeguarding, buildings, parents, staff, children and relationships in school. She creates a welcoming vibe with sculpture, pottery, biscuits and tea. She finds that teachers are amazingly flexible resilient creatures and admires the way they adjust to change and just get on with it. She believes a good school has embedded systems and frameworks to help achieve cohesion in dealing with change so that more risk-taking, innovation and creativity can take place. 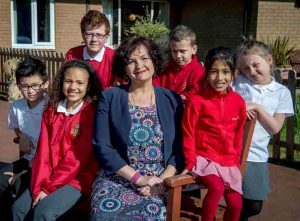 She leads with hope and optimism not fear and Ofsted found her school forward thinking and outward reaching – positively connecting with a range of ideas and people in her community and beyond. She believes there should be an acknowledgement of diversity and more allowance for humanity within the whole education system. I find it impossible not to agree with every word she says!!!!!!! !